The Doctor's Consultation: Is depression going up? Unfortunately, when you look at writing something about depression, it can be depressing, all on its own! Depression is unfortunately an integral part of life and living, and there cannot be many people who can say they have never been depressed in their lifetime. Does this mean we are all mentally disturbed? Fortunately, no! Whilst we all sail between depression and elation (which we medico’s call Euphoria, just to be different), it is only when the mood stays down in the depths that it becomes a problem. The (relative) highs and lows are just part of the normal range. When your cat dies you feel sad, and when you win 10,000 baht you feel great. These are “normal”. However, the extremes of these moods do exist in the community, and are very prevalent. When we begin to look at the various incidence rates the whole situation can become quite interesting. Did you know, for example, that women get depressed twice as much as men, but the suicide rate for men is five times that for women? Did you also know that the World Health Organization (WHO) is predicting that by the year 2020 depression will be the major contributing factor to the burden of disease in the developing world (and that could be us, if the baht stabilizes and all these Free Trade Agreements work)! Other interesting facts emerge from the world-wide study of depression. In women, the highest rates of depression occur in the 18-24 year age group, while in men it peaks in the 35-44 year age group. Men really are from Mars and Women are from Venus perhaps? Of course, the statisticians have managed to come up with other associations, which may or may not be relevant. Such as the statistic that 50 percent of people with depression also suffer from some physical problem or illness. For me, it is a case of the chicken and the egg. Which came first? Are these people depressed because they have an illness or does the depression make them more prone to illness? The answer is probably a bit of both. For example, the risk of Ischaemic Heart Disease (Angina and the like) is three times greater in men diagnosed as having depression, and it has also been found that depression is present in 45 percent of patients admitted to hospital with a heart attack. So what kind of person gets depression? The personality profile includes those who are “worriers”, perfectionists, shy and socially anxious, and those with low self esteem. It also includes people with low thyroid function, infectious diseases, cerebral (brain) blood vessel disease through diabetes of increased blood pressure, chronic pain and cigarette smokers. The apparent differences between women and men may also be more imagined than real. That females report twice as much depression as males may be a reflection of the male upbringing, where boys are taught that it is “weak” to show their emotions, which subsequently results in under-reporting their symptoms. So what can be done about this depression epidemic? Fortunately modern treatment is producing some worthwhile drugs which can elevate the mood without making the person into a zombie. However, medication should not be thought of as the only way to go about it. A pocketful of pills and you are instantly better is not what happens. There should also be careful psychological assessment and assistance given with the planning of activities, the sleep cycle and structured problem solving. Early intervention is important too, so if you are getting depressed, now might be the time to do something about it. The plaintiff (sic) letter from Lemonade has touched my soul. (“I am trying to buy a second-hand car. I don’t have much to spend, but I want a good one. I have trudged in and out of so many car sales outlets, I am starting to get depressed. The sales people don’t want to talk to me and none of them seem to be able to speak English. Don’t they want to shift the vehicles in their forecourts? Have you any foolproof way to make sure I don’t buy a lemon? Lemonade.” August 6th) I have a car parked up in Thailand that he can have. It’s a Corolla, bought new by myself about 13 years ago and this is accident-free, has been regularly serviced and hardly driven (65K Km only). It has been parked up at the home of a Thai friend for many years and looked after by his driver. If Lemonade can come up with 175K baht it’s his and good luck to him. He needs to contact me at [email protected] for more information as I am in UK at present. Thank you for responding to Lemonade’s plaintive (not ‘plaintiff’, Petal, that’s a legal term) letter. If she (it was a she, not a he) has not managed to get something by now, expect an email. Since this is being printed in the column, there might even be others reading this who could be needing a 1992 Corolla. May the fleetest of foot be the winner. I must admit I never thought I would end up being a car saleslady! Do I get a commission, Keith? You have got to be joking, Jerry (I won’t call you Petal, as that is too good a term to be wasted). The ladies that I hear about in these columns have no problems with communications at all. “Darling, buy me motorcy so I can go to market and get things for you.” He understands, and he does. “Darling, buy me house so I have place for you when you come back.” He understands, and he does. “Darling, buy me gold so I can give to my mother.” He understands, and he does. Every week there are outpourings from another broken farang heart, who understood what was being asked of him, and handed over, despite all the books, articles and the wisest advice in my columns. Advice given in English, so the lad from Birmingham cannot claim he didn’t understand the advice either! These people don’t want to hear about the traps, and that’s what they are. Traps, and nothing else. They blind themselves and end up paying the consequences, both in emotional grief and in cleaned out bank accounts. The ladies communicate very well, Jerry. It is the farangs that cannot communicate with their own brains that is the problem. They let another part of their anatomy do the thinking, and it isn’t too bright either. Would you like a success story for your column? Remember the song “I got you babe” (Sunny and Cher) about two people who fall in love and think love will pay the bills? Well it does not work in the UK or America or anywhere, as we all know. Two years ago I met a bar girl in Chiangmai who was from Isaan. She was intelligent and very proud of her family - did not like her work - but as many do, did it for survival reasons. She went back to her village two months after I met her and has now her pride back and works in a simple family business and earns less than 150 baht a day. I send her money every month and visit her village two times a year - and when I visit I am treated like a family member by all her family. We intend to get married in one year’s time and I know you have got to provide for the one you love, no matter where you live in the world, but the rewards in Thailand are well worth it. Hillary prints success stories, when successes send them in, but the successful ones are people who are happy in their relationship and do not need advice from Hillary, so this is one reason why you do not read them too often. Your point is well taken and should be understood by everyone who is contemplating entering a relationship anywhere in the world. Love (alone) does not pay the bills. There is an obligation to provide and I am very pleased to see that you have accepted that, and that it is working out for you, but remember too that one couple is not every couple. And also, you have a little way to go yet, my Petal! Interesting that you picked on that Sunny and Cher song - remember what happened to them? Camera Class: What makes a prize winner? One of the regular readers of this column wrote in to ask just what makes a “good” photo, so I thought I would go back to the days when I was a judge at amateur photography club competitions. And a thankless task it was too! You make one person in 50 very happy and alienate 49. Turn down all offers of being a judge. There are many ways of marking a photo competition entry, and some judges have separate scoring columns, something like wine judges. They look at and give points for composition, sharpness, appropriateness of subject matter, the zone system, tonal values and so it goes on. Very technical, very demanding and very time consuming. And not all that accurate, as I have often seen judges retrospectively awarding or removing points because in the end picture number 43 “looks” better than picture number 27 which somehow got more marks! Judging photographs is like judging wine - very subjective, forget the objectivity! When I judge a photograph, the initial impact is what is important. Does the photograph leap off the wall, or does it hang there limp like last year’s calendar? After the initial impact, I then look to see how the impact was achieved. Was it through colour, or contrast, or subject matter, or cropping or design? And then, was that impact done in a technically correct manner? Many amateur photographers also think that if the judges are going to like a photograph of a fungus, they will be twice as impressed with two fungus photographs, and three fungus photographs must surely get them a gold medal! For some reason known only to amateur photography clubs, these entries are always entitled Fungi I, Fungi II and Fungi III. Probably the most important attribute to any photograph is for the judge to immediately work out what the shot is about. Who or what is the “hero”? It really has to jump out at you, which gets us back to what I call the First Rule of Photography, which is to walk several meters closer before you pop the shutter. 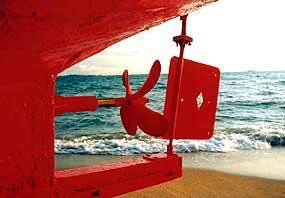 The other factor that will detract from the impact is fussy backgrounds that distract the eye from the central subject. Even fungi! Always be aware of backgrounds and try to select some better ones, or move the subjects, to make a more pleasing result. Good photographs do not happen. Good photographs are made! I might call that the Second Rule of Photography. It is only at this stage that I begin to look at the technical details. Is the shot in focus? Is the horizon horizontal? Is the print processed sharply with good colour rendition? I should have mentioned that the size and framing is important too. No judge at a photo comp is going to struggle to squint at a 6x4 print, no matter how good it is in other respects. The size you get back from your friendly photo shop is related, in most instances, to the size of a 35 mm negative. The 6x4 print is very roughly of the same proportions as the 35 mm negative, so what you see on the negative can be reproduced on the photographic paper. This is great in theory, but does not necessarily correspond to the subject you want to photograph. Not everything, or everyone, fits neatly into a 6x4 format. Enlarge (and crop where necessary) to around an 8R size (10x8) at least; however, do not go too big, or your print will tend to lose sharpness and definition, and the colours will tend to lose their intensity. A simple frame should also be used, to keep the main feature being the (hopefully) prize winning photograph. Gilt carved heavy wooden frames take away from the impact, not otherwise. So what really does make that prize winner? In a word, it all comes down to impact. If you have a shot that, in your opinion, has the power to jump off the wall, get it blown up to an 8R, simply framed and hang it in your home. As I mentioned at the outset, the end result is subjective, so your opinion is just as important as mine. Just don’t shoot fungi! This last group of the FCI breed group classification is the Sight-hounds. They are the oldest type of hunting dogs, tracing their ancestry approximately 5,000 yeas ago in the Middle East as high-status hunting dogs in ancient civilizations, and then spread to Europe, Russia and India. 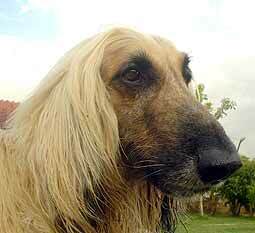 Afghan Hound: originally bred for hunting the fox and gazelle and guarding the tents. As the breed group’s name already indicates, they were specially bred for tracking down their prey by sight rather than by scent. Two hunting methods can be distinguished: 1. Chase-catch-and-kill explaining their ‘hardness’ in the mouth, contrary to the soft mouth of the retrievers that weren’t allowed to damage the prey in any way, or 2. Chase-catch-and-secure the prey until the human hunter arrives, due to local religious traditions that required the game to be killed in a ritual manner. Depending on these hunting methods and on the way they were transported, two types of dogs can be recognized, the finely built ones and the more heavier built ones, in three coat varieties, long haired, rough haired and short haired. Some examples are the Saluki: a finely built long haired dog, transported on top of the camel. As soon as it detected the game it needed to jump off and chase it. The Afghan Hound, a more heavily built dog with a long coat, running with the hunter and used for hunting large game in mountains where it could be very hot during the day and extreme cold during the night. At night they were supposed to guard the tents. The Deerhound and Irish Wolfhound, heavy built rough haired closely related breeds and, therefore, hard to be distinguished by the layman. Short-haired and finely built breeds are the Whippet and Greyhound. Due to their task as hunting dogs all are slender, elongated, fast-running athletes, which have great acceleration power and can reach enormous speeds. The character of a Sight-hound is two-fold. Inside the house they are quiet easy-going, balanced dogs, and although a little reserved towards strangers, in general they are friendly towards people and other animals. They love company and prefer to play doormat on large comfortable cushions. Typical for a Sight-hound is their very independent character, often in a reserved, almost arrogant, way. You could compare them with cats: ‘they may have an owner, but they certainly do not have bosses’. Once outside their true hunting nature will come out. Always alerted by everything that moves, and once spotted it is hard stopping them from chasing it. This does not imply, by the way, that these dogs are not trainable. The unfortunate truth of the myth that Sight-hounds are hardly trainable comes from a lack proper training, naturally resulting in hard to control dogs, but this is due to the owner, not to the dog. Since peaking at 121.29 in July 2001, the U.S. Dollar Index (DXY) depreciated by 33.72% in U.S. dollar terms, reaching a cyclical low of 80.39 in December 2004. 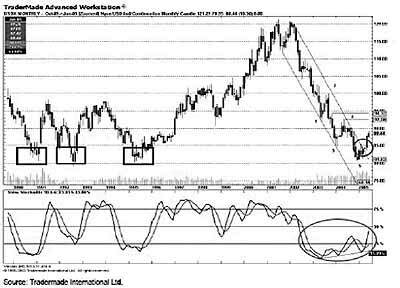 However, the move to 80.39 remained above a textbook triple bottom pattern that formed between 1991-1995, as a series of bullish divergences formed on the monthly stochastic study. In addition, the valuation metrics denoted in the monthly studies had been lingering in oversold territory since late 2002. With a possible retracement magnified by the establishment of a potential Elliott Wave structure as prices tested the aforementioned triple bottom, a significant technical development took place in April. Specifically, the monthly close above the descending channel top at 84.08 confirmed the valuation concerns and wave counts, by producing a bullish long term trend reversal for the DXY. From a technical standpoint, price action indicates that market sentiment has begun to shift in favour of the USD. This caused us to shift from our long-held bearish technical view of the USD to bullish. Prices will have to close below 81.03 on a monthly basis in order to neutralize the bullish trend reversal from April. After reaching a low of 0.8232 in October 2000, EUR/USD reversed course and rallied to a cyclical high of 1.3663 in late 2004. This move represented a 39.75% depreciation in the USD over roughly 4 years. 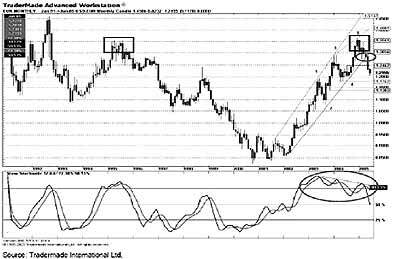 However, the long-term rally in EUR/USD began to show signs of exhaustion in December 2004 when prices formed a double top at 1.3561 on a monthly closing basis. With the monthly stochastic study producing a series of bearish divergences after lingering at overbought levels since early 2003, the probability of a price retracement increased dramatically. While this later triggered a valuation-driven retracement, the resulting monthly close below the ascending channel base at 1.2931 in May produced a bearish long-term trend reversal while simultaneously confirming a terminal 5-wave Elliott Wave structure. This caused us to shift from our long-held bullish technical view of EUR/USD to bearish. With political uncertainly set to continue to weigh on EUR/USD over the short-term, the bearish long-term channel breakout indicates that corrections to resistance at 1.2462 and 1.2743 should attract selling pressure for an attempt to test the double bottom from 2004 at 1.1762, which serves as our primary price target. A monthly close below this level would project additional losses toward secondary support at 1.1536 and 1.1383. Note that 23.6% retracement of the October 2000-December 2004 advance at 1.2381 has already been exceeded, with 38.2% Fibonacci retracement conveniently located just above our secondary support level at 1.1588. Prices will have to close above 1.3056 on a monthly basis in order to nullify our bearish long-term view. My home in America sat on a street lined with other 100 year old houses separated by skinny driveways. It looked good inside and outside, but there was a rotting structure in between held together by immortal asphalt siding, new roof shingles and 17 coats of paint on the interior walls. Some days it insulated us from 40 below weather but never from our neighbor’s lives. When the woman next door took a long shower, we’d run out of hot water. Nights resounded with Neil Diamond hits from the 70s on one side and Dog Hell on the other. 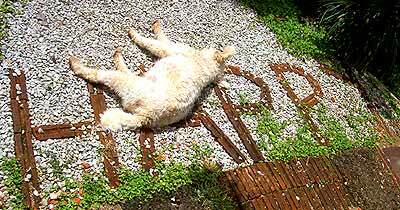 The perfect dog next door, preferably dead. Our nicer-than-nice neighbor worked nights at a local bar. Always pleasant and friendly, he even watered our lawn and garden when we were out of town. However, his two pleasant and friendly dogs, the familiar Brown Dog and the popular Grey Dog from the Heinz 57 breed became Satan’s Dogs when he left for work. They’d stand on their doghouse roof, howling incessantly at anything: anyone walking by, another dog barking in another state, the moon, the streetlight posing as the moon, one of the stars in the sky, whatever. Neighbors complained, but he never got it because, although the lights were on in his head and his house, he wasn’t home. Perpetually pleasant and friendly, he was hard to hate. I like dogs. The concepts of encasing their heads in duct tape, Superglue in their Puppy Chow or a neighborhood Mystery Meat BBQ were not options. For a formal complaint the police said I’d need documented proof, barking timetables, and signatures from anyone that had died due to the noise. Then I’d have to stand up in court with Mr. Friendly Who Waters My Lawn. In the dead of winter, I set a recorder on the fence to document the racket and gathered testimonies from neighbors. One morning my daughter, very sick with the flu, staggered downstairs moaning about the barking that had kept her awake all night. I snapped. Time for immediate creative problem solving. I got a dirty, crumpled scrap of paper and pencil. With a left-handed, nearly illegible scrawl, I wrote “If the dogs bark again, they will be killed” and put the note in his mailbox. We never heard the dogs again. They lived in his basement. Soon he moved away from us local savages. A five-minute solution without police intervention, vigilante activities or the People’s Court! The key to success may have been the apartment building across the alley from his house. Filled with foreign folks from Somalia, Pakistan and other exotic countries, he probably imagined they had sabers, crossbows or hand grenades provided by the US government … and ate dog regularly. He was just a corn-fed, simple boy from the state of Iowa which stands for Idiots Out Walking Around, Imbecile On Wheels Ahead or Island Of White Americans. I doubt this technique would work here with the stray Soi Dog Breed that still guards your entire community which was once the camping ground of his ancestral, nomadic, Neanderthal owners during the Ice Age. If your neighbors received the note, they’d most likely offer to help with the killing or request an invitation for dinner.